The aim of this project is to produce age-appropriate non-fiction books for children from birth to age 12. These books are richly illustrated with photographs, diagrams, sketches, and original drawings. Wikijunior books are produced by a worldwide community of writers, teachers, students, and young people all working together. The books present factual information that is verifiable. You are invited to join in and write, edit, and rewrite each module and book to improve its content. Our books are distributed free of charge under the terms of the Creative Commons Attribution-ShareAlike License. Please see What is Wikijunior? for more information about this project. 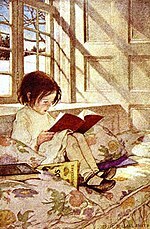 There are more than a dozen Wikijunior books and hundreds of sections within those books being readied for publication. Additional Wikijunior books are under development. Wikijunior has some great books for you to read. But you can also help writing books! If you know something about a subject and want to share it with others, just click on the link that says "edit" and type in what you want to say. It's that easy! It's easy to get started. Just click on an edit button and begin writing! We encourage you to be bold and edit articles. Look through our full collection of books and add content where you can. Start a class project to write a new book or contribute to an existing, developing one. Tell us how we're doing on the talk page. Check articles for grammar, style, and spelling. Monitor the recent changes to Wikijunior pages. There's a Wikijunior Style Guide with suggestions for how to write great Wikijunior content. You can discuss the project at the Wikijunior talk page or one of the Wikibooks reading rooms to get a broader audience. To chat about Wikijunior on IRC, use Freenode or join #wikibooks on Freenode. Thank you for visiting Wikijunior! Readers of Wikijunior are served the latest reviewed version of a page. With this feature enabled, vandalism should not be seen as often by readers. Please adjust the "edit review" settings in your preferences to always show the latest version of content pages, if you do not want this. We hope you will enjoy using this resource as much as we've enjoyed making it. This page was last edited on 5 April 2019, at 16:35.